Using the online automation platform, Integromat, will make it easy to connect all of your work apps with the missing piece and simplify your work process. 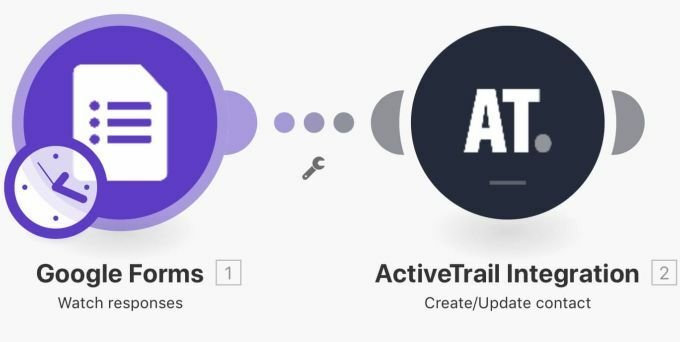 With the integration builder, you can drag and drop ActiveTrail to hundreds of other apps to create powerful integrations, all without writing any code. These integrations will transfer and transform your data exactly as you need to automatically complete your email marketing activities. What can it help you do? Integromat allows you to connect ActiveTrail to hundreds of apps with thousands of different modules to automate all of your email marketing tasks. -Watch for contact added group (instant trigger) – triggers when a contact is added to a group. How it works is you can link a number of different ActiveTrail modules to thousands of other modules in other apps to automate all your email marketing processes. And the best part, you can link together as many as you want using many different Integromat exclusive features without further cost or pain to you. Every time a new attendee signs up for your Eventbrite event, Integromat will automatically add a new contact to an ActiveTrail group of your choice. This is just the beginning, Click here to see the entire list and to create your own custom integrations. How to connect to Integromat? -First, if you don’t have an account with Integromat yet, start by signing up for free at www.integromat.com. -Next, go to your Dashboard and click the Create a new scenario button. -When creating your first scenario using ActiveTrail, Integromat will prompt you to connect after you choose your module. -Click the Add button to begin your connection. -Next, it will prompt you for your API key to connect. You can find your API key by logging into your ActiveTrail account. -Paste your key into the panel in Integromat and click Continue. -And, that’s it. You are connected to Integromat!